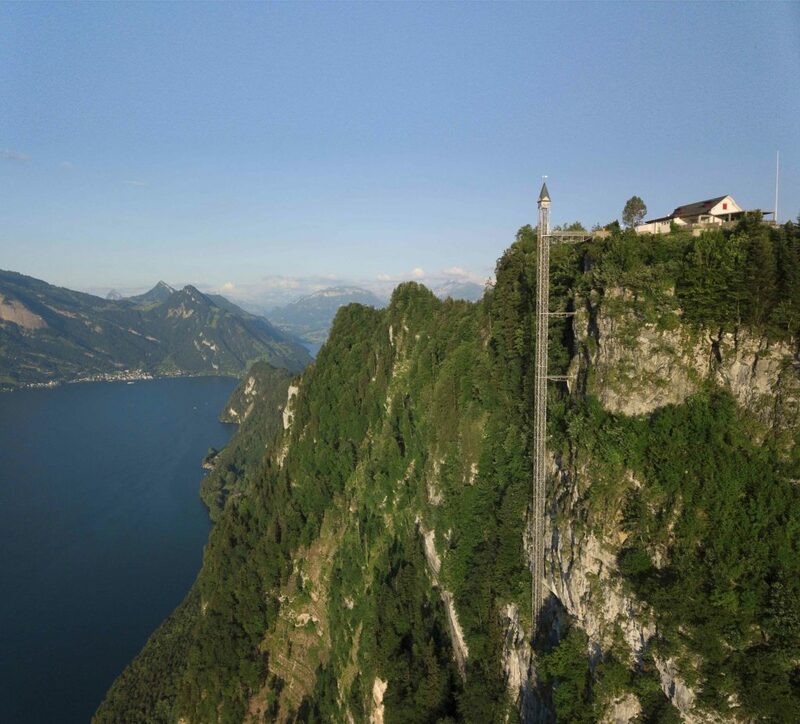 Perched on the edge of the Bürgenstock mountain and piercing the clouds above Lake Lucerne at an altitude of 1,132 metres, the open-air Hammetschwand Lift was a marvel of ingenuity and engineering when it opened in 1905. More than a century later, it still is. I’m with a small group of tourists that has arrived at the base of the lift after a 30-minute stroll along a wooded path skirting — and, at times, passing through — the rocky hillside. The Hammetschwand Lift still draws tourists more than a century after it was built. Turns out the brains behind Europe’s tallest outdoor elevator were on to something. Over the years the tourist spot has attracted everyone from Charlie Chaplin and Kofi Annan to Indira Gandhi and Sophia Loren, as well as the cast and crew of the 1964 James Bond thriller Goldfinger. The Hammetschwand Lift was conceived by Franz Josef Bucher and Josef Durrer, who acquired property on the Bürgenberg ridge in 1871 and went on to transform the area into one of the world’s leading resort destinations. The pioneering entrepreneurs – who initially entered the hotel industry to provide work for carpenters associated with their sawmill business — opened the Grand Hotel in 1873, followed by Switzerland’s first electric cable car, the Bürgenstock Funicular, and the Park and Palace hotels around the turn of the century. Friedrich Frey-Fürst bought the hotels in 1925 and handed them over in 1954 to son Fritz Frey, who brought a taste of Hollywood to the hills by inviting artists and entertainers such as Yul Brynner, Marcel Marceau, Shirley MacLaine and Olivia de Havilland. Audrey Hepburn and Mel Ferrer were married at the Bürgenstock Chapel in 1959 and Loren lived with Carlo Ponti in a chalet on the grounds for several years in the 1960s. 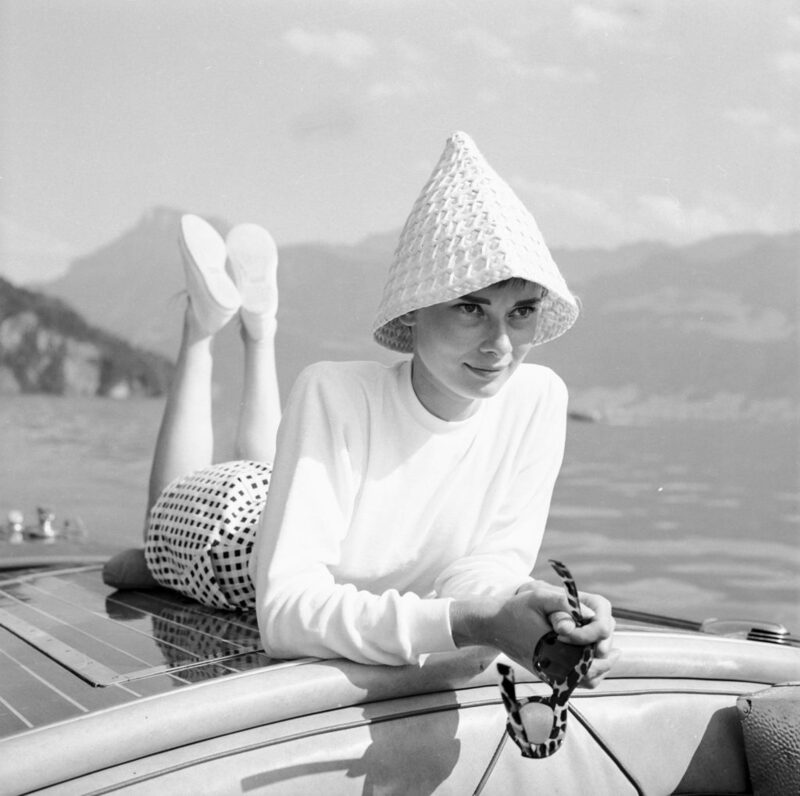 Audrey Hepburn relaxing on Lake Lucerne. Now, after nine years and an investment of US$1 billion, Katara Hospitality is unveiling the rebranded Bürgenstock Hotels & Resort. The sprawling complex comprises four hotels, including a medical and wellness centre, nine restaurants, a cinema, shopping centre, nine-hole alpine golf course, tennis courts and an ice-skating rink. A thousand guests have made their way to Lucerne to celebrate the grand opening with the Qatari hotel owner and developer, our group flying into Zurich and then catching a train to Lucerne, a ferry to the base of the Bürgenstock mountain and the charming fire-engine red funicular to the peak and lobby of the Bürgenstock Hotel. 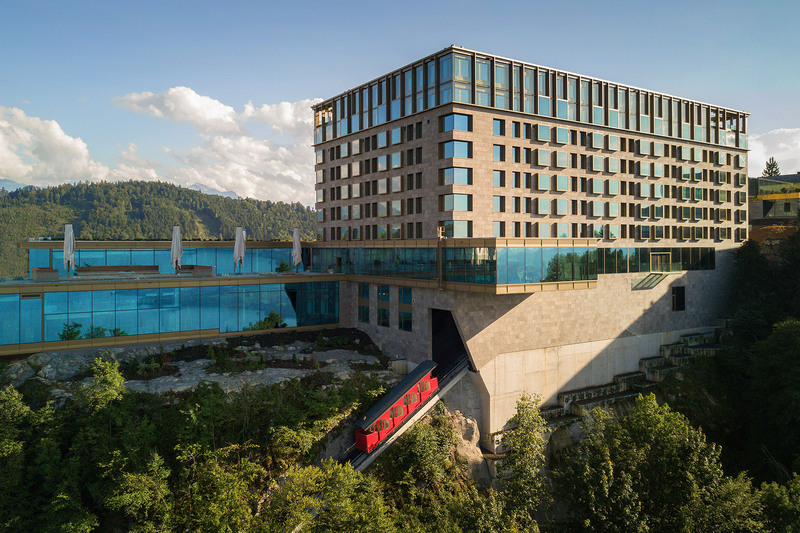 The Bürgenstock Resort with its fire-engine red funicular. Walking past the ubiquitous watch displays — this is Switzerland, after all — we find ourselves in an inviting reception area complete with roaring fire and gleaming limestone floors. But the real draw, from here and almost every corner of the resort, is the view over Lake Lucerne, which extends in four directions like sinuous fingers. At dusk the sky over the distant shore bursts into a rainbow of blues, pinks and purples, having shed the layer of clouds that accumulate most mornings. 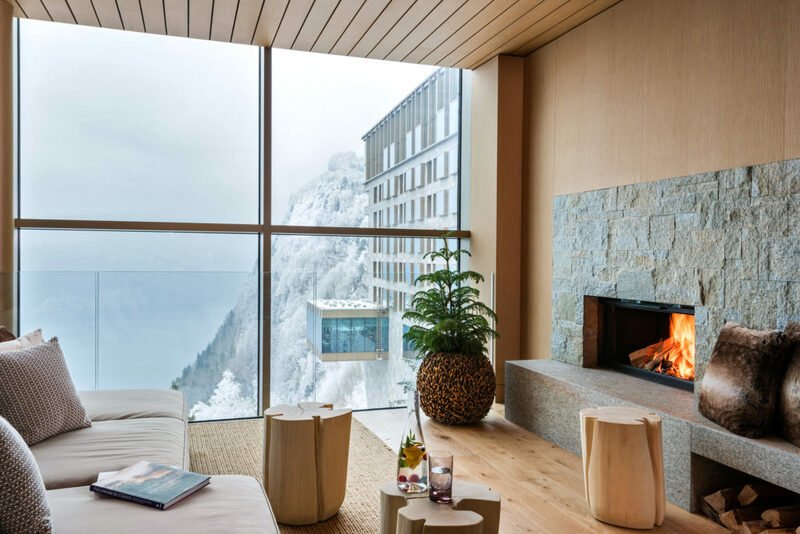 One of the best vantage points to be had is in the guestrooms of the Bürgenstock Hotel, while soaking in the oversize tub next to a glass-enclosed fire. But probably the biggest draw, and certainly the most popular among social-media followers, is the adjacent 10,000-square-metre Alpine Spa. The three-storey spa has everything I’ve ever wanted in a wellness retreat: the usual saunas and steam baths, but also an infrared sauna, iceroom, saline floating bath, nap shells and waterbeds for lounging. View from the Alpine Spa. Not to be missed is the outdoor infinity pool that extends from the indoor lap pool and appears to float above the lake. It’s easy to spend hours exploring the wet and dry areas before curling up near the fireplace to enjoy the view from the floor-to-ceiling windows of the Serenity Room. But we’re here to celebrate and the Bürgenstock does not disappoint. After a ribbon-cutting ceremony attended by Qatari dignitaries and Katara managing director Bruno Schöpfer, the doors of the Bürgenstock and Palace hotels are thrown open to reveal lavish food stations serving up mountains of Kaviari caviar, raclette cheese from the cows grazing in the pastures behind the hotel, Thai salads from the Asian-themed Spices Kitchen & Terrace, and spit-roasted lamb from the Sharq Lebanese and Qatari eatery that occupies Loren and Ponti’s former villa. The evening is capped off with a stunning fireworks display lighting up the entire Bürgenberg ridge, and dancing that continues past midnight in the ballroom. The next morning, we awake to find the hotel nestled inthe clouds as if it too is not yet ready to get out of bed and back to work. 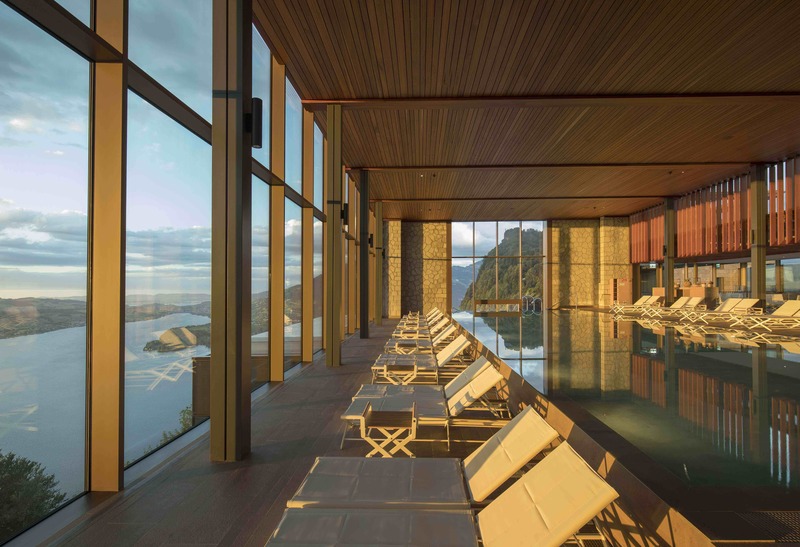 But there is plenty more to take in at Bürgenstock, including a visit to the Waldhotel to learn about its innovative medical and therapeutic services. The high-tech hotel/hospital provides tailored programmes covering everything from mobility and weight management to cryotherapy and anti-ageing. Guests can relax and recuperate in specially designed south-facing rooms with private terraces, and a dedicated spa with various pools, saunas and steam rooms. Indoor and outdoor pools and the sundeck at the Alpine Spa. The walk back to the main hotel passes the Gothic chapel built in 1887 and made famous by Hepburn and Ferrer’s wedding – their son Sean, who was born in Lucerne, attended the resort’s grand opening — as well as the rustic Taverne 1879 serving local delicacies, including dried meat from the nearby Sepp farm and bubbling pots of Swiss fondue. We also pay a visit to the historic listed Palace Hotel, built in 1903 and fully renovated with its grand lobby leading out to a terrace where Sean Connery and his Goldfinger crew relaxed between scenes. The heritage theme extends to the French fine-dining restaurant, Ritz Coffier, with its decorative copper pots and the doors salvaged from the Grand Hotel’s original walk-in refrigerator. I venture out later to visit the tennis academy and join the locals hiking some of the 70 kilometres of trails winding through the forests and pastures, where the only sound to be heard is the ceaseless ringing of cowbells and the occasional “moo”. With all this, not to mention the Hammetschwand Lift, I can only assume the problem won’t be getting people to come to Bürgenstock. It will be getting them to leave.